When federal prosecutors last week announced that charges against Julian Assange included conspiracy to “break a password to a classified U.S. government computer,” one immediately assumed that the password in question had actually been broken. However, an indictment unsealed Monday indicates that may have not been the case. It also appears U.S. attorneys have been doing their best to minimise that fact. Did he ever actually try? A better question might be, can the government prove it? What did Assange do, if not actually help crack a password, to merit charges of conspiracy to commit computer intrusion? Details offered by the indictment are sparse and we know little about the government’s evidence so far. But at least some of the descriptions of the crime itself seem oddly familiar. In fact, I think they’re in my job description. I’d like to do that now: If you have material you believe is newsworthy, please visit our SecureDrop page to learn more about how to safely transmit it to Gizmodo. We’d be happy to receive it. Journalists are supposed to take every legal measure possible to conceal the identity of a source for whom the news outlet has agreed to provide anonymity, particularly ones who leak sensitive information. Journalists may even go as far as to agree in advance to accept jail time rather than identify a source; though traditionally, such agreements require the approval of an editor. 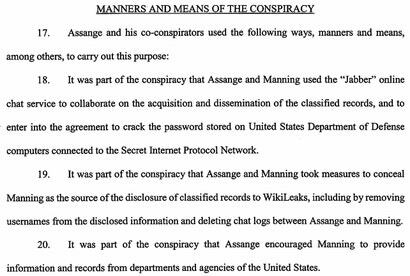 “It was part of the conspiracy that Assange encouraged Manning to provide information and records from departments and agencies of the United States,” the indictment also states. And here’s where it gets tricky. At no point during any conversation with a source would I ever suggest they break the law, or continue to break it to get me any additional information. While there’s no legally binding code of ethics for professional journalists that require them to notify law enforcement when a source says something like, “I’m going to hack to Pentagon next week,” technically, they could be charged with a crime. The U.S. Code, for instance, includes an offence known as “misprision of felony,” whereby it’s illegal to withhold information about a crime if directly asked by a federal investigator. Asking sources to use a method of communication that doesn’t leave a trail of evidence behind them is likely standard practice for every major newspaper in the U.S. Naturally, the first thing a potential whistleblower considers when debating whether to leak is how likely it is they’ll be captured. The more sources that do get caught, the fewer that will come forward. “If the Justice Department had filed an indictment focused more narrowly on the alleged hacking, none of this would warrant much comment,” ACLU Director Ben Wizner wrote Monday. It’s important to understand that freedom of the press in the United States depends heavily on the right of news organisations to publish illegally obtained information — without the threat of having their reporters thrown in jail. Famously, the Supreme Court broadly interpreted the First Amendment to protect the New York Times and the Washington Post in a 1971 case focused on the publication of the Pentagon Papers. Another relevant and more recent case is Bartnicki v. Vopper, in which the Supreme Court ruled that a talk radio host could not be held liable for airing a taped conversation that was illegally recorded. Similarly, in a disturbing 2010 case, the Supreme Court upheld the vacated conviction of a man who’d distributed videos depicting acts of animal cruelty that he did not himself take part in. But a common thread in all of these cases is that the publishers of the illegally obtained material took no part in the crimes committed and didn’t specifically encourage anyone to break the law. To convict Assange of conspiring with Manning, the government will need to prove that’s exactly what he did. There is also, of course, plenty of debate over whether Assange should or should not himself be considered a “journalist.” However, in the past, most of that debate was focused around the possibility of an espionage charge, which the government has decided not to seek or unveil, at least for now. 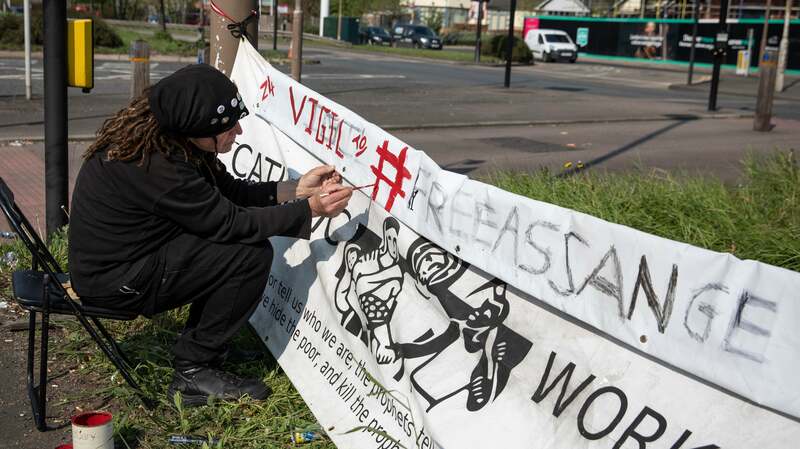 Legal experts remain sharply divided over whether WikiLeaks is considered a news organisation; many admit it’s not clear that if that even matters; and there’s ample disagreement over whether Assange, who is Australian, can even invoke First Amendment protections. Notwithstanding, the only publicly known evidence of Manning and Assange communicating so far are chat logs. The government’s case would seem difficult to prove (beyond a “shadow of a doubt”) if that was its only card. During Manning’s court-martial, the Army’s chief prosecutor stated repeatedly that the government had evidence proving it was Assange who was in direct communication with Manning. In one instance, the prosecutor claimed that “forensic examiners were able to recover contact information for Julian Assange” from Manning’s laptop. Potentially, the government could have an eyewitness placing Assange at the keyboard during that conversation. (If memory serves, he would’ve been in Iceland at the time.) It could also have surveillance, electronic or otherwise, proving somehow that he participated in those conversations himself. But a chat log alone is a flimsy piece of evidence. The best and worst thing about the internet is that anyone can pretend to be anyone they want. Even Julian Assange.